There are four different types of Mechs available: Light, Medium, Heavy and Assault. 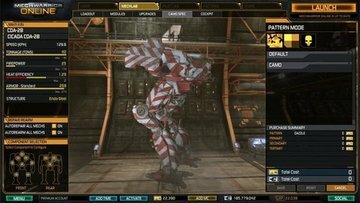 The Light Mechs being the most agile and fast, while Assault focuses on equipping additional armor and more powerful weapons at the expense of speed. While the other two types of Mechs are in between the two. A Mech can equip various weapons and technologies such as: close range melee weapons, ballistic medium range weapons and missiles. Technologies include fall damage reductions, anti missile systems and increased running systems. There are various other unique technologies players can obtain as they progress. There are also a lot of skills that can be gained by gaining experience in battle.